with support from: Commissioned by Science Gallery at King’s College London. Sculpture part of the Guy’s and St Thomas’ Charity fine art and heritage collection. Tom Jordan is a professional writer and editor, part-time actor, and full-time dad. He’s done his fair share of globe-trotting, with stints living in Australia and the Middle East, and has had numerous other travel adventures in the line of the written word. He’s now living back in his native Yorkshire, aiming, like Keats, to focus on his creative endeavours, which include fiction, rhyme and children’s media projects. He's on Twitter @MrTomJordan. Born in Moorgate in 1795, John Keats trained as a surgeon-apothecary at Guy's Hospital before deciding to devote his career to poetry. In his short and brilliant life he wrote some of the greatest poems of the Romantic period, including To Autumn, Ode on a Grecian Urn and Lamia. In 1819 he presented his beloved Fanny Brawne with the sonnet Bright Star as a declaration of his love; however, before they could marry he died in Rome of tuberculosis at the age of 25. 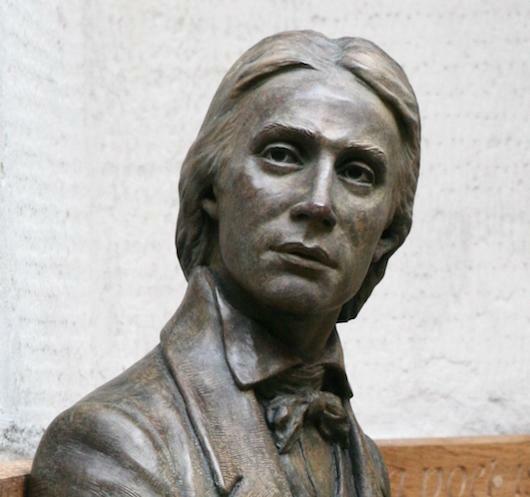 The bronze Keats statue was created for Guy's by sculptor Stuart Williamson, and was unveiled by the poet Andrew Motion in 2007. Commissioned by Science Gallery at King’s College London. Sculpture part of the Guy’s and St Thomas’ Charity fine art and heritage collection.